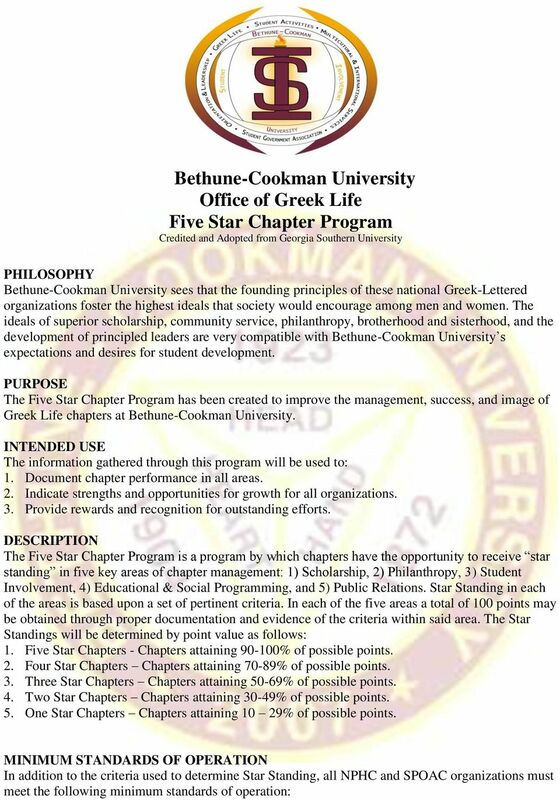 Download "Bethune-Cookman University Office of Greek Life Five Star Chapter Program Credited and Adopted from Georgia Southern University"
2 1. be active in and in good standing with their respective governing council. 2. be recognized in accordance with the University s recognition criteria for student organizations. 3. provide all requested paperwork/reports to the Office of Greek Life by the specified deadlines (i.e. Insurance Documents, Registration, etc) INCENTIVES The following incentives program has been developed. Five Star Chapters 1. $1000 to be used toward chapter improvement activities or programs. 2. Plaques recognizing the chapter s Five Star Standing will be awarded at the Greek Awards Banquet. 3. The organization s National Office will receive a letter of recognition as to the chapter s accomplishments. 4. Campus Recognition Four Star Chapters 1. Plaques recognizing the chapter s Four Star Standing will be awarded at the Greek Awards Banquet. 2. 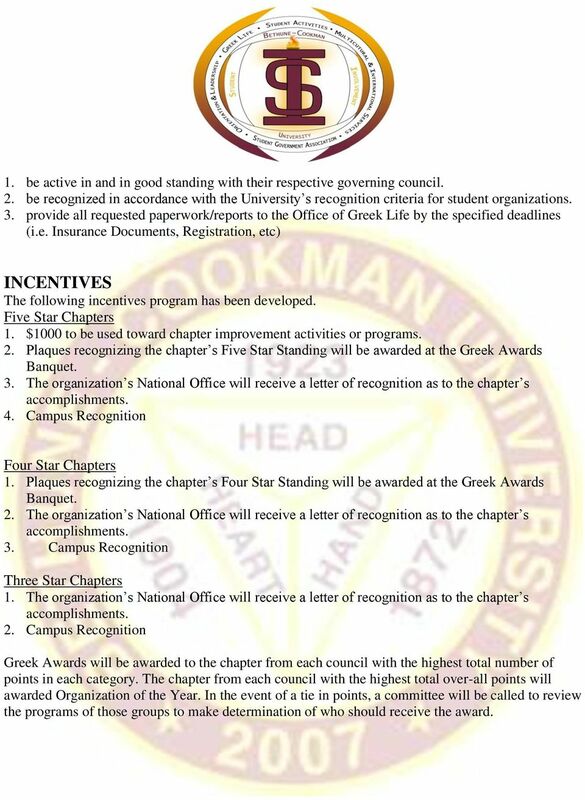 The organization s National Office will receive a letter of recognition as to the chapter s accomplishments. 3. Campus Recognition Three Star Chapters 1. The organization s National Office will receive a letter of recognition as to the chapter s accomplishments. 2. Campus Recognition Greek Awards will be awarded to the chapter from each council with the highest total number of points in each category. The chapter from each council with the highest total over-all points will awarded Organization of the Year. In the event of a tie in points, a committee will be called to review the programs of those groups to make determination of who should receive the award. 3 SCHOLARSHIP It is of the utmost importance that Greek Life Chapters place a strong emphasis on and dedication in the academic success of their individual members and their chapter as a whole. 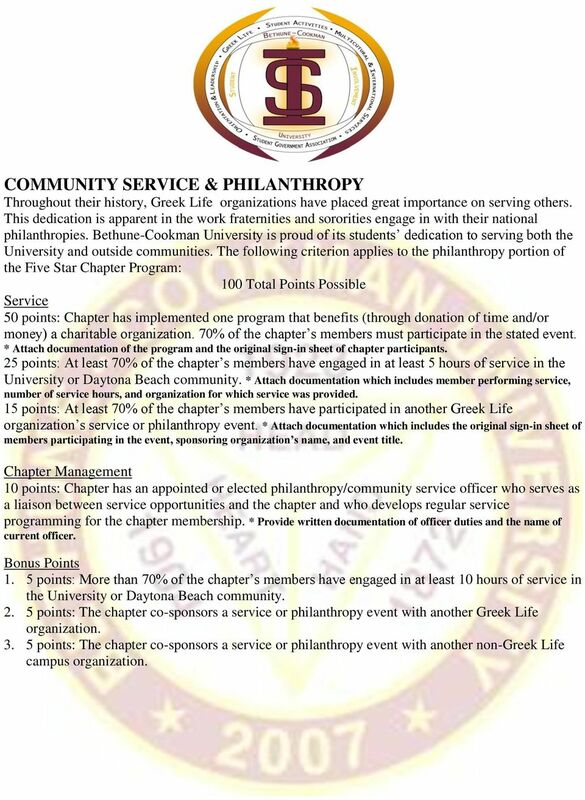 Greek Life chapters should support the academic mission of Bethune-Cookman University and provide their members with an environment that is conducive to academic success. 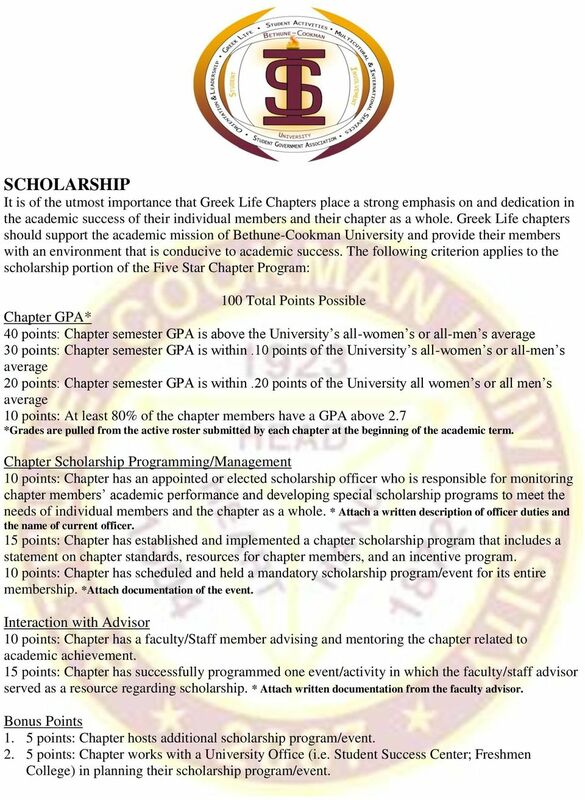 The following criterion applies to the scholarship portion of the Five Star Chapter Program: Chapter GPA* 40 points: Chapter semester GPA is above the University s all-women s or all-men s average 30 points: Chapter semester GPA is within.10 points of the University s all-women s or all-men s average 20 points: Chapter semester GPA is within.20 points of the University all women s or all men s average 10 points: At least 80% of the chapter members have a GPA above 2.7 *Grades are pulled from the active roster submitted by each chapter at the beginning of the academic term. Chapter Scholarship Programming/Management 10 points: Chapter has an appointed or elected scholarship officer who is responsible for monitoring chapter members academic performance and developing special scholarship programs to meet the needs of individual members and the chapter as a whole. * Attach a written description of officer duties and the name of current officer. 15 points: Chapter has established and implemented a chapter scholarship program that includes a statement on chapter standards, resources for chapter members, and an incentive program. 10 points: Chapter has scheduled and held a mandatory scholarship program/event for its entire membership. *Attach documentation of the event. Interaction with Advisor 10 points: Chapter has a faculty/staff member advising and mentoring the chapter related to academic achievement. 15 points: Chapter has successfully programmed one event/activity in which the faculty/staff advisor served as a resource regarding scholarship. * Attach written documentation from the faculty advisor points: Chapter hosts additional scholarship program/event points: Chapter works with a University Office (i.e. Student Success Center; Freshmen College) in planning their scholarship program/event. 4 COMMUNITY SERVICE & PHILANTHROPY Throughout their history, Greek Life organizations have placed great importance on serving others. This dedication is apparent in the work fraternities and sororities engage in with their national philanthropies. Bethune-Cookman University is proud of its students dedication to serving both the University and outside communities. The following criterion applies to the philanthropy portion of the Five Star Chapter Program: Service 50 points: Chapter has implemented one program that benefits (through donation of time and/or money) a charitable organization. 70% of the chapter s members must participate in the stated event. * Attach documentation of the program and the original sign-in sheet of chapter participants. 25 points: At least 70% of the chapter s members have engaged in at least 5 hours of service in the University or Daytona Beach community. * Attach documentation which includes member performing service, number of service hours, and organization for which service was provided. 15 points: At least 70% of the chapter s members have participated in another Greek Life organization s service or philanthropy event. * Attach documentation which includes the original sign-in sheet of members participating in the event, sponsoring organization s name, and event title. Chapter Management 10 points: Chapter has an appointed or elected philanthropy/community service officer who serves as a liaison between service opportunities and the chapter and who develops regular service programming for the chapter membership. * Provide written documentation of officer duties and the name of current officer points: More than 70% of the chapter s members have engaged in at least 10 hours of service in the University or Daytona Beach community points: The chapter co-sponsors a service or philanthropy event with another Greek Life organization points: The chapter co-sponsors a service or philanthropy event with another non-greek Life campus organization. 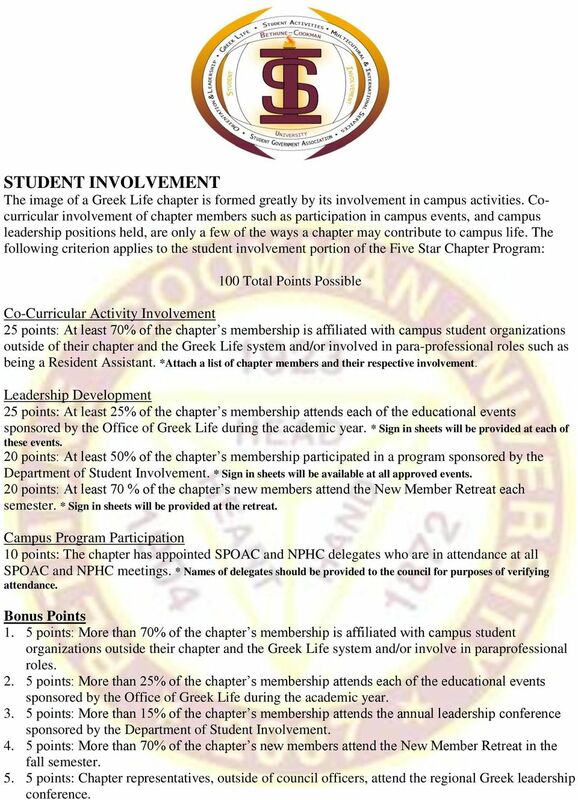 5 STUDENT INVOLVEMENT The image of a Greek Life chapter is formed greatly by its involvement in campus activities. Cocurricular involvement of chapter members such as participation in campus events, and campus leadership positions held, are only a few of the ways a chapter may contribute to campus life. The following criterion applies to the student involvement portion of the Five Star Chapter Program: Co-Curricular Activity Involvement 25 points: At least 70% of the chapter s membership is affiliated with campus student organizations outside of their chapter and the Greek Life system and/or involved in para-professional roles such as being a Resident Assistant. *Attach a list of chapter members and their respective involvement. Leadership Development 25 points: At least 25% of the chapter s membership attends each of the educational events sponsored by the Office of Greek Life during the academic year. * Sign in sheets will be provided at each of these events. 20 points: At least 50% of the chapter s membership participated in a program sponsored by the Department of Student Involvement. * Sign in sheets will be available at all approved events. 20 points: At least 70 % of the chapter s new members attend the New Member Retreat each semester. * Sign in sheets will be provided at the retreat. Campus Program Participation 10 points: The chapter has appointed SPOAC and NPHC delegates who are in attendance at all SPOAC and NPHC meetings. * Names of delegates should be provided to the council for purposes of verifying attendance points: More than 70% of the chapter s membership is affiliated with campus student organizations outside their chapter and the Greek Life system and/or involve in paraprofessional roles points: More than 25% of the chapter s membership attends each of the educational events sponsored by the Office of Greek Life during the academic year points: More than 15% of the chapter s membership attends the annual leadership conference sponsored by the Department of Student Involvement points: More than 70% of the chapter s new members attend the New Member Retreat in the fall semester points: Chapter representatives, outside of council officers, attend the regional Greek leadership conference. 6 EDUCATIONAL & SOCIAL PROGRAMMING Greek Life organizations offer the opportunity for members to gain leadership and personal development skills through programming. Programming in Greek Life organizations spans from social activities to leadership seminars. Each program contributes to the chapter s success and individual member s personal growth. The following criterion applies to the educational/social programming portion of the Five Start Chapter Program. Educational Programming 40 points: The chapter has developed and implemented (or utilized a national program) for New Member Education which includes leadership training and an emphasis on scholarship, personal growth, standards of conduct, and student involvement. * Attach written documentation of the program including a calendar. 15 points: The chapter has developed and implemented an alcohol/risk management program for its entire membership (80% of the membership must be present at the program). * Attach documentation of the event and original sign-in sheet of chapter participants. 15 points: The chapter offers one program through another University office (i.e. counseling services, Student Success Center, Residence Life, Multicultural Services, etc.) to its entire chapter membership (70% of the membership must be present at the program). * Attach documentation of the event and original sign-in sheet of chapter participants. 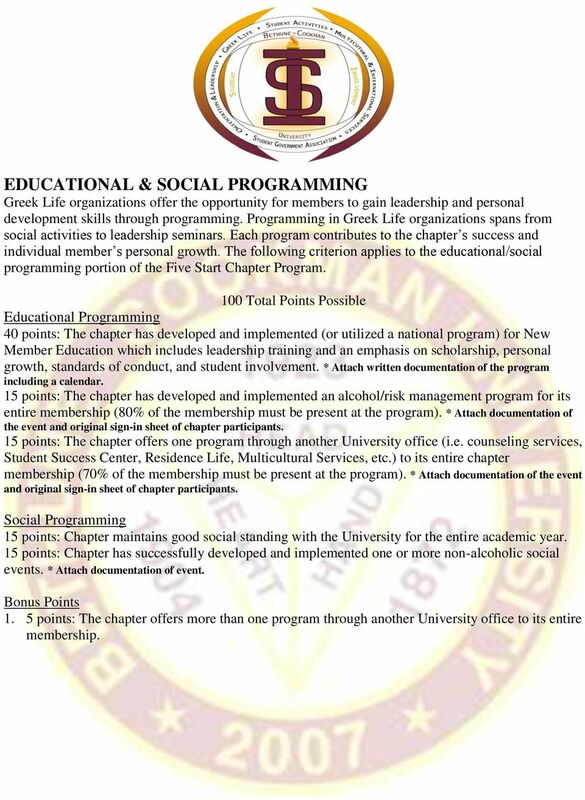 Social Programming 15 points: Chapter maintains good social standing with the University for the entire academic year. 15 points: Chapter has successfully developed and implemented one or more non-alcoholic social events. * Attach documentation of event points: The chapter offers more than one program through another University office to its entire membership. 7 PUBLIC RELATIONS The image that a Greek Life organization builds for itself is vital to the chapter s success. Strong relationships with faculty, administration, the Daytona Beach community, and the student body are crucial in maintaining a positive image. The following criterion applies to the public relations portion of the Five Star Chapter Program. Campus Relations 20 points: The chapter collaborates with another student organization to co-sponsor a non-alcohol event or speaker, including financial contributions, promotion of the event, attendance by at least 25% of the chapter members at the event, and assisting with on-site management. * Attach documentation of event and original sign-in sheet of chapter participants. 15 points: The chapter is not sanctioned for intake infractions, hazing violations, or other dishonorable conduct that is not seen as misconduct. 15: points: The chapter has hosted a program in which Bethune-Cookman University faculty and staff members have been invited. * Attach documentation of event and a letter of support from a faculty/staff member. Alumni & Parent Relations 15 points: The chapter sponsors at least two events per year for alumni. * Attach documentation of the event and a letter of support from an alumnus. 15 points: The chapter sponsors at least one event per year for parents. *Attach documentation of the event and a letter of support from a parent. 10 points: The chapter sends at least one newsletter per semester to both alumni and parents. * Attach copies of these newsletters. 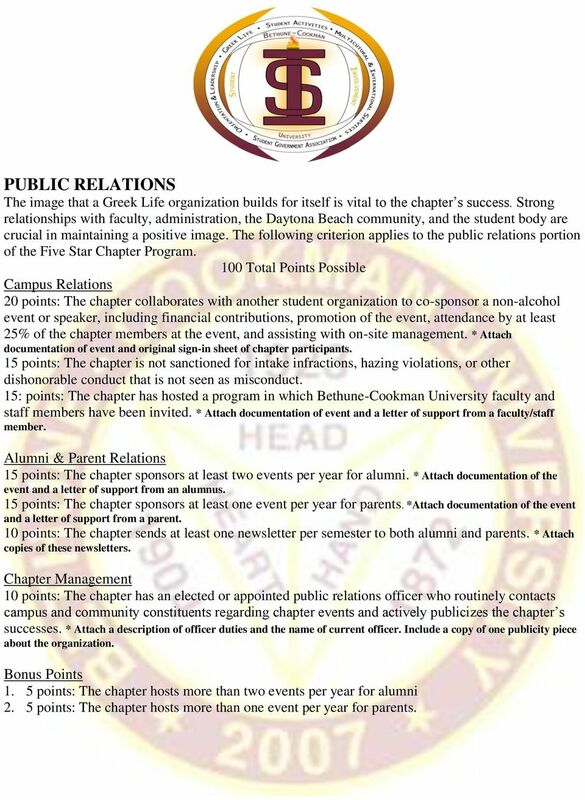 Chapter Management 10 points: The chapter has an elected or appointed public relations officer who routinely contacts campus and community constituents regarding chapter events and actively publicizes the chapter s successes. * Attach a description of officer duties and the name of current officer. Include a copy of one publicity piece about the organization points: The chapter hosts more than two events per year for alumni 2. 5 points: The chapter hosts more than one event per year for parents. The Society of Women in Business At Georgia Institute of Technology 2015-2016 Sponsor Guide 1 Table of Contents Georgia Tech & Scheller Rankings and Facts p. 3 Letter from the EVP p. 4-5 SWiB Goals p.